RedCSur: Reshaping What “South” Means. Lecture by Mabel Tapia. 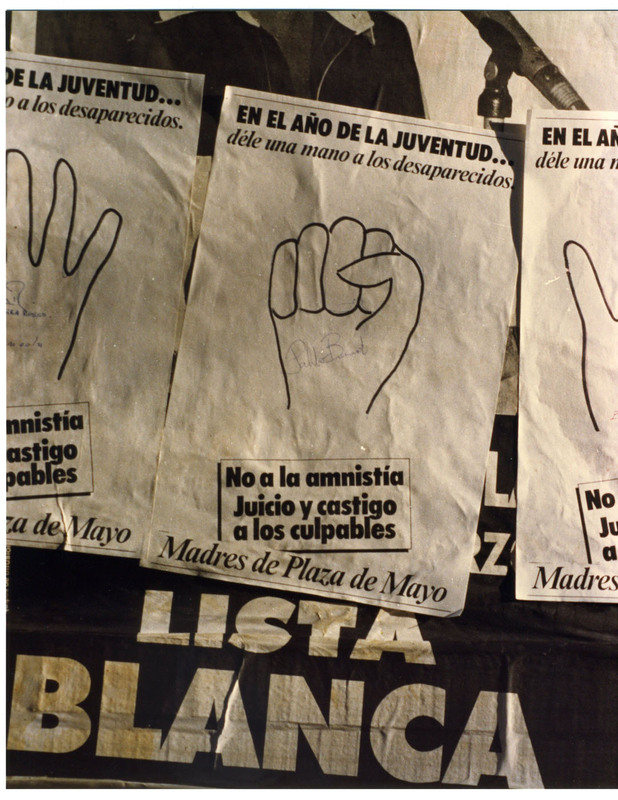 Activist poster reading “déle una mano a los desaparecidos” [“give a hand to the missing”], 1985, photo courtesy Edward Shaw and Centro de Documentación en Investigación de la Cultura de Izquierdas en Argentina. In its founding declaration, the Red Conceptualismos del Sur (Southern Conceptualisms Network) adopts “a strategic use of the term ‘South’.” It is used with the purpose of intervening in the geopolitical segmentation of Latin America, within the current hemispheric conjuncture. The geopolitical condition of the “South” is not used as a metonym for the geography of Latin America, but as a discursive tool for dismantling “centrality” and reversing the epistemic “marginality” through which global “conceptualisms” have been historicized. Through the strategic and geopolitical use of the term “South,” the Network seeks to ensure that the Latin-American stance is informed not by a reclamation of some regional cultural identity, but rather that it allows the rethinking and revision of the strict dichotomies that divide center and periphery, canon and counter-canon, First and Third worlds, Western and Non-Western. Mabel Tapia is an independent researcher. Her research focuses on art practices from the twentieth century involving the use of archives, activism, and political engagement that has as one of its main characteristics the deactivation of the aesthetic function. Her publications include (as editor), Losing the human form. A seismic image of the 1980s in Latin America (2013, 2014), Really Useful Knowledge (2014), and Desinventario (2015). RedCSur is a collective initiative bringing together a set of researchers and artists scattered around various parts of Latin America and Europe, and which proposes to establish itself as a platform for common thought and action dealing with contemporary relations between art and politics. It was founded in 2007 by a group of researchers concerned about the need to intervene politically in the neutralization processes of critical potential of a set of “conceptual practices” that took place in Latin America since the early sixties. Over recent years, the RedCSur has been involved in a long term reflection on the uses and politics of archives, working on the organization and constitution of some of the most important artists archives in South America. Between 2011 and 2014, the network led the research project about the 1980s. The exhibition and the publication Losing the human form. A seismic image of the 1980s in Latin America produced in collaboration with the Reina Sofia Museum represented the culmination of the project’s first phase and it was presented in Peru and in Argentina.